A minor lapse in comprehension caused me to believe, for about the first half of this collection, that I was reading a book called Imitations. 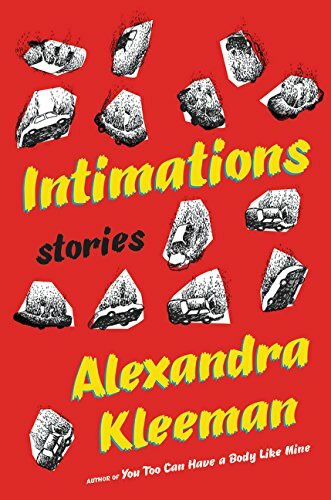 I liked that title (though the actual one, Intimations, is more than adequate), because it struck me as slyly self-aware, particularly when applied to an author’s first story collection. (Kleeman’s debut novel, You Too Can Have a Body Like Mine, was published last year to great acclaim.) Writers learn to write stories by imitating their influences, and Kleeman’s collection is more mindful than most when it comes to sampling the various traditions of American short fiction. The book is divided into three sections (which promotional material describes as “birth, living, and death,” though that is an oversimplification). The first offers a set of surreal stories that feature characters floundering under the expectations of others. In “Fairy Tale,” the narrator might be describing a dream: she is at a dinner with her parents and a man who claims to be her fiancé, though she does not recognize him and feels no attraction to him. As the story proceeds, more and more men show up at the table, each claiming to be a boyfriend or lover or paramour, and the pressure for the narrator to choose one leads to increasingly extreme scenarios. In “The Dancing-Master,” the eponymous instructor is goaded by the village philosopher into teaching a feral boy to dance like a proper gentleman: “Portesquieu would claim that this is impossible, that a body cultivated in the wild assumes the essence of wildness, turns swampy and will not admit of the growth of more refined habits. But with my labor, I prove him wrong: my wild child dances the minuet on command, as well as several other current dances.” The dancing-master achieves his pedagogical aims through use of a rod. When left to his own devices, the poor wild boy much prefers to chew on whatever objects are available. In their cold, fantastic minimalism, these first stories recall the work of Aimee Bender or Robert Coover (whose lengthy blurb, given its own page at the beginning of the book, functions like an oddly self-referential epigraph). The section ends unexpectedly with “Intimation,” a nightmarish parable where an unnamed narrator finds herself trapped in a dynamic house with a man who seems to think that they are in a relationship. Though the story reverts to the surrealism of the first section, after the three Karen stories it is difficult not to read this narrator, too, as Karen (or a version of Karen), and to interpret the story not simply as an allegory for marriage in general but for Karen’s marriage to Dan (or her awkwardness with the German). What’s more, the piece invites the reader to think back to the stories in section one, particularly “Fairy Tale,” and insert Karen into those narrative as well. Like an avocado pit surrounded by malleable flesh, the Karen stories orient the pieces around them, providing the reader a notion of center. The final story, “You, Disappearing,” is a dystopian tale of a world laid waste by the incremental disappearance of objects: apples, trousers, magazines, parts of Ferris wheels. “Nobody thought the apocalypse would be so polite and quirky. Things just popped out of existence, like they had forgotten all about themselves. Now when you misplaced your keys, you didn’t go looking for them.” But pets disappear as well, as do people, memories, even entire concepts. The narrator is unnamed, though she is in love with an architect. They are unmarried, without children, torn apart by the disparate ways they react to a world in which the disappearance of all things is inevitable. “There had been times,” the narrator writes of her boyfriend, “when I thought I might be with you indefinitely, something approaching an entire life. But then when there was only a finite amount of time, a thing we could see the limit of, I wasn’t so sure. I didn’t know how to use a unit of time like this, too long for a game of chess or a movie but so much shorter than we had imagined.” The story is perhaps the collection’s strongest, benefiting not only from the intimacies of this unnamed couple, but from the accrued emotions of all that has come before it: the lives (or potential lives) the reader has lived with Karen, lives which will not occur in the world of this final tale. It is interesting that Intimations should appear so shortly on the heels of the American publication of Claire-Louise Bennett’s Pond. Though the books are largely dissimilar, they both take well-established strategies for giving a novel an innovative kick and apply them to the medium of the short fiction collection. (Some reviewers have referred to Pond, which is composed of self-contained short stories, as a novel. They are mistaken. Mislabeling a linked short story collection as a novel does a disservice to both forms.) In the case of Pond, Bennett adapts the accumulating, knot-of-language aesthetic used successfully in the works of David Markson and, more recently, Eimear McBride. Kleeman, on the other hand, is working in the surrealism-neighboring-naturalism tradition of preceding wunderkinds like Téa Obreht and Jonathan Safran Foer, where sections of dreamlike allegory supplement sections telling the primary “real life” story. These tropes, when employed by novelists, have grown to feel quite domesticated over time, anchored as they are to book-length narratives that mostly guarantee a sense of progress by the end. In applying them to story collections, Bennett and Kleeman have essentially thrown out the instruction manual, allowing the reader to assemble whatever larger narrative they are able, knowing it will be incomplete and that there may even some parts leftover. Save for a few standouts, the stories are not as strong, individually, as their original publications (The New Yorker, The Paris Review) might suggest. Several pieces obstruct more than they aid in explication. At 40 pages, “A Brief History of Weather” is a collection within a collection, divided into titled sections that follow a family’s attempt to create a house immune from and absent of any weather. It feels like Kleeman’s attempt to create her own Cooverian fragmentary epic (à la “The Gingerbread House” or “Seven Exemplary Fictions”), but the motifs are a bit too spasmodic and numerous (games, Russian dolls, unattributed quotes, an invented twin) to add up to anything coherent. The ethereal “Hylomorphosis” reads (purposefully) like a piece of 16th-century angelology that, while initially promisingly, refuses to solidify into anything digestible for mortal readers. Even the Karen stories are rather unexceptional when removed from their context in the book. Cumulatively, though, the collection offers an experience that is more surprising and, in some ways, more provoking than that of a standard collection composed of better stories. Kleeman is masterful at the sentence level. At the book level, she is ambitious and inventive. Once she works out the interstitials, she’ll be spawning imitators of her own. Michael Deagler 's fiction has appeared in Glimmer Train, New England Review, Electric Literature's Recommended Reading, and elsewhere. He was a 2016-2017 fiction fellow at the Fine Arts Work Center in Provincetown, Mass. His website is michaeldeagler.com. This is the story of a woman living out her last days in exile with the excruciating memory of watching the torture and crucifixion of her only son. In Tóibín’s hand, the Virgin Mary is more than her role as a mother or a symbol. Instead, she becomes the most interesting of creatures: a credible human. Yet another book about World War II may seem like a yawner. Because, seriously, what hasn’t been written about the subject already? With the history side of things well-documented, most new books delve into personal accounts of the war years. In Never Surrender, British author Michael Dobbs does just that, but with a twist. The result is, according to the cover, “A novel of Winston Churchill.”Historical fiction can bring out the best or worst in a writer. Sometimes the author is an academic with nothing but names, dates and the question: What if? That approach often manifests itself in hundreds of pages consisting of too much history and not enough fiction. Other times the perfect balance is achieved, as with Michael Shaara’s The Killer Angels, a novel about the Civil War battle at Gettysburg.After reading this 316-page novel, it’s clear the historical fiction genre suits Dobbs well. Never Surrender strikes the right balance.The book is set primarily in 1940, in the weeks leading up to and including Great Britain’s desperate retreat from the European mainland and Adolf Hitler’s advancing Nazi army. Churchill’s leadership was still in its infancy, and he had few allies, both in England and beyond. The book serves as a vivid reminder of just how close the island nation came to striking a deal with Germany, and how reluctant the United States was to offer military aid to its weakened ally.But Churchill is not the only character in this book engaged in battle. Across the channel in France, a young medic and conscientious objector named Don Chichester witnesses the horrors of war as the dead and wounded are brought before him.They laid him on the kitchen floor – the table was occupied – and a doctor slowly unwrapped the sodden cloth. Two terrified eyes stared out, but of the rest of the face there was almost nothing. No lower jaw, no tongue, no cheek, only those two staring eyes which understood it all. Fingers clutched Don’s sleeve with the force of a man under siege from pain he was incapable of resisting.Such descriptions are used sparingly, making them all the more powerful, and realistic, for Don is soon separated from his unit and joined by a wounded French soldier in search of safety back in England.By giving an equal amount of attention, and text, to the realities on the ground and to the decision-makers back in London, the novel deftly moves back and forth between the historical and the fictional. Churchill’s survival is certain; Don’s fate is less so.Yet the two men share a similar handicap: Both are crippled by feelings of unfulfilled expectations set by their fathers. And it takes the unsolicited counsel of a foreigner for each to gain perspective.Dobbs, who is a former advisor to prime ministers Margaret Thatcher and John Major, is no armchair historian. His proximity to England’s leaders has made him privy to the psychological burdens carried by those at the top. Furthermore, his experience as a newspaper reporter on both sides of the Atlantic is demonstrated by a fluid writing style full of English subtlety and wit.While the 2003 book, rereleased in paperback this September, is the second in a series – Winston’s War (2002), Churchill’s Hour (2004) and Churchill’s Triumph (2005) – about events before, during and after World War II, it is undoubtedly capable of standing alone. Some readers may desire to see what comes next, but reading what comes before will require a 704-page commitment.Of course, any piece of historical fiction opens itself up to sins of omission. Certain events are left unmentioned, meaning readers who have studied the second World War in depth might feel like moviegoers who watch a film adaptation of their favorite book.At the same time, the opposite can be true for those not steeped in the history of World War II. Questions may linger throughout about whether certain characters are historical or fictional. Fear not, all is explained in the epilogue. But it’s safe to say that those who appear fictional are just that. So trust your literary instincts. “Choking Victim” was inexplicably published in the New Yorker. An astoundingly lifeless piece of fiction, as though an assignment turned in by an undergrad without any passion for writing. I’m sure she has an MFA and lives in Brooklyn, though, so she must be good. Snud is right. Also, this brand of surrealism is reaching the stage of senility. It’s been done and done and done and done and done. It was getting tired by 1979. Snud and Anon seem a little disgruntled about the New Yorker, MFAs, short story collections, maybe publishing in general. I sense all the markings of failed novelists in our midst. The stories I’ve read in Intimations so far are far from “astoundingly lifeless.” And so surreal is dead? Got it, no one write any more surreal stuff. It’s done according to Anonymous authority above. C’mon! These stories feel familiar, understated, in a very good way. I open a book I want the author to show me something different. With INTIMATIONS I get that and more. What has been tired since 1979 is the whole anti-MFA thing. Flannery O’Connor, Richard Price, John Irving, Raymond Carver, all writers mentioned in above review… they’re all MFA’ed up dude! Silvo, yes because only “failed novelists” are critical of other work? The mark of a successful novelist is unconditional love of the New Yorker, MFAs, and short story collections? Please, tell me more. All this stuff we’re talking about has nothing to do with what’s inside this book. Lets read the book. Then be critical. That’s how criticism works. Jeez, look at the time. Signing off from my Brooklyn apartment b/c it’s a school night! I got an early MFA workshop tomorrow and I want to read the new New Yorker story before bedtime. Silvo: what would make you think that only someone who wants and had failed to write fiction would be critical of the constant stream of stale fiction that is published on a daily basis? You think only writers read? You can’t be a painter and like to read? Or an accountant? Or a secretary? I don’t understand your thought process? Everyone who hates superhero movies is really just a failed filmmaker who wanted nothing more than to direct the next Avengers movie? Is that what you really think? I don’t think the author of this piece knows the meaning of the words masterful, ambitious, and incentive. Her prose is indistinguishable from a thousand other workshop wonders; she’s written the 8657th book of linked short stories, and her scope is pretty limited. None of this makes her a bad writer, but by god, enough with the marketing hyperbole. When did criticism get replaced by cheerleading? Can we stop making people out to be geniuses when they’re merely good and improving? Do I need to read the whole story to find out why all these men were berating faceless, bodiless entities on their phones? I mean, were none just having a conversation, say, with a Person? Why were they all berating these entities, and why just men? It is quite a hook. AW heck, maybe I will just fling myself on my horse and ride madly off in all directions. Did I mention it was a dark and stormy night? Marie Kondo has a method for cleaning and reorganizing your home that might be crazy and might be brilliant, but works either way. She’s a lifestyle celebrity in Japan, and her finely-tuned method is spelled out in her book, The Life-Changing Magic of Tidying Up: The Japanese Art of Decluttering and Organizing. Kondo’s philosophy is that you should only own things that you love, that everything else is just wasting both physical and emotional space. Although some of her advice can be eyebrow-raising (you’ll see), I decided to commit, following her advice to the letter one Saturday in January. You start with your clothes. Kondo has you take every piece of clothing you own out of your closet and dresser and pile them on your bed. Then you pick up each item one by one and gauge your emotional reaction to it. Only items that “spark joy” in your heart when you’re holding them in your hands get to stay. Kondo does concede that discerning the joy levels of your clothing can be hard at first, but she also says that you develop your gauge as you go, which turned out to be true. I started holding my skirts out in front of me and kind of being like, “This might be joy?” But after a few minutes I got to my navy silk dress with the little teacups printed on it, and sparks flew. After that epiphany, I essentially gauged my reaction to each item in comparison to my reaction to the dress. For instance, at one point I found myself trying to coax some joy out of a grey pencil skirt, because ladies’ media has told me I should own one in black and grey, but then I realized that said skirt had nothing on what I felt for the teacup dress, and it was out of my life. This is what sets Kondo’s method apart from your average declutter. You’re not merely rooting out the stuff you could get by without, you’re winnowing down to what you truly want to keep. Now I have a closet that basically smacks me in the face with joy every morning. Once you’ve done your clothes, you go through the rest of your possessions by category — books, then papers, toiletries, electronics, household goods, photos, and your kitchen. The joy meter becomes less relevant to some of these — after all, necessities like my phone charger, prescriptions, and apartment lease don’t light me on fire — but the guiding principle remains the same. You consider everything you own item by item, and decide whether or not you have a compelling reason to keep it. Kondo has helpful insight into each category’s parameters: books — “‘sometime’ means ‘never;’” papers — “discard everything;” gifts — “the person who gave it to you doesn’t want you to use it out of a sense of obligation, or to put it away without using it.” But everybody will have different hang-ups about different categories. Since I knit, sew, do pottery, and am generally crafty, I was hanging on to a lot of stuff just because I had made it. A few years ago I knit myself a sweater that turned out ugly and didn’t fit. I legit hate that sweater, but it was in my dresser for two years because the yarn was expensive and I spent months on it. With Kondo in my head, it made no sense to keep something that sparked hate and remorse rather than joy. Tossing it into a hefty bag, on the other hand, was pure joy. And let’s be honest about this — this is a joy that comes from privilege. The subtext of Kondo’s advice, which is never stated, is that you have plenty and always will. I don’t remember if she mentions money in the book, but if she does it would only be to say that monetary value is a bad reason to keep something. She does say that one of the reasons her book is necessary is that tidying up isn’t a life skill that parents teach to their children like cooking or finances. In my case, at least, it’s not that my parents didn’t teach me about handling my possessions, it’s just that they were teaching me opposite values. I grew up in a house, as did my parents before me, in which pennies were pinched, both out of necessity and the belief that it was morally superior behavior. The slightest hint of past, present, or future utility would be reason enough to keep something, no matter how unloved it was. As I was talking to my friends about going through Kondo’s book, most of them had the same perspective. We live in different economic circumstances than our parents did — summed up neatly by the fact that at my age my mom was married with three kids, whereas I spent a solid 40 minutes this morning researching how best to cover up a bald spot in my eyebrows — but we still use their model of consumer behavior. I didn’t want to use Kondo’s book as a way to shuck everything they taught me about the value of money and things, but as a guide to applying those values to my own situation. And while she never mentions this either, Kondo’s book has the potential to make you a smarter consumer. In the month since I decluttered, I’ve noticed that I’m less tempted to buy new things. Because my apartment is only filled with things I love, I can’t imagine bringing home a new sweater because it’s kind of cute. Imagine how inferior it would feel in my carefully curated closet! New things have to meet a higher standard to seem like a justifiable purchase, and in this way a massive purge can be read as thrifty behavior — unless these are just rationalization gymnastics because I could picture the horrified look on my mom’s face when I got rid of the handmade sweater. Kondo says that we keep things for one of three reasons: their functional, informational, or emotional value. But most of the time we’re lying to ourselves about that value. Any time I was hesitating over whether to keep something, I would ask myself which of those values I perceived in it, and then call my own bluff. Why do you want to keep these ugly pink and black plaid note cards? Because I might use them. Why do you want to keep this change purse? It was a gift and I like it. Why do you have this packet of reading materials from college? Because someday I might want to brush up on the history of the Russian intelligentsia. I did, at some point, start yelling KONDO! every time I tossed something onto the throwaway pile. It was a long day. According to the book, I was supposed to be wearing my favorite outfit and listening to soothing music. I was wearing my pajamas and listening to Guns N’ Roses, but I have to think at some level Kondo would just want me to do me. As she tells it, she’s been passionate about tidying since she was a child, staying in at recess to tidy the classroom instead of playing with other kids, reading lifestyle magazines, and getting in trouble for reorganizing her family’s closets. This lifelong, single-minded devotion to tidying has made her advice the best around, but also might have loosened her relationship to normalcy. I don’t follow her advice to kneel down and thank my apartment for keeping my possessions safe when I get home in the evening, for example, but I’m really glad I got rid of the table lamps I wasn’t using. The only time I truly wondered if I was taking the advice of a madwoman was when she was describing her evening routine, which starts with arriving home and kneeling, as outlined above, unpacking and putting away every item in her handbag, and then thanking and respectfully storing her clothes so their spirits can be refreshed. But then this: “If you can’t empty your bag sometimes, that’s all right…Just between you and me, while writing this book, there have been times when I came home and fell asleep on the floor without even changing my clothes.” Wait, what? But, for all that, she’s a good teacher. Her book is not meant to tell you what you should keep or throw away but to be “a guide to acquiring the right mind-set for creating order.” I got rid of seven trash bags and two boxes of stuff, and have continued to hone in on joyless possessions that I missed or let slide the first time. Kondo says that now that I’ve put my house in order I’ll probably find love and my dream job and lose 10 pounds, but while I’m waiting for that to happen my apartment looks great.